It is 1917 and the Amish have not yet decided whether to ban the flying machines that are taking the country by storm. While they abhor the use of them as a weapon of war across on the frontlines of France, Jude Whetstone has been allowed to take flying lessons in Philadelphia and members of the Lapp Amish community are amazed at the tricks that his plane can do. But Jude is only intent on impressing one person – Lyyndaya Kurtz, a childhood friend whose parents do not approve of his flying. Being banned from spending time with Jude is bad enough for Lyyndaya, but when Jude and several other young men from their community are imprisoned for refusing to fight in the war taking place in Europe, Lyyndaya wonders if she’ll ever get to see Jude again. When Jude’s friends are mysteriously released from military prison on the same day that he volunteers to fly on behalf of the United States Air Force, Lyyndaya’s fears are confirmed as Jude is placed under the bann. But soon she has matters closer to home to worry about, as her sister and various other members of the community fall ill with the Spanish Flu. While continuing to write letters to Jude that she knows he won’t be able to read until he returns home, Lyyndaya helps the local doctor nurse her friends and family back to health. Meanwhile, Jude is quickly being lifted up in the ranks of aviation as members of the Air Force witness his flying abilities. But can he bring himself to kill? And even if he manages to survive the war without taking another man’s life, will he ever be accepted back into his community? And will they ever understand why he felt called to sign up? Just as with Ruth Reid’s The Promise of an Angel, I was doubtful as to whether this unusual blend of genres would work. And just as I was completely won over by the angelic characters in Ruth’s novel, I completely fell in love with Murray Pura’s take on the Amish during the First World War. The Wings of Morning wasn’t simply an attempt to break out of the typical mould of Amish romances by sticking the story in front of the backdrop of WWI. Murray’s writing showed that he’d researched not only military camps and bases, the treatment of conscientious objectors and the role that aeroplanes played in WWI, but the actual flying of these planes. I don’t claim to be an expert on early twentieth century flying machines but I’ve visited the Museum of Flight in East Fortune and listened to my dad talking about aviation enough to figure out that the descriptions given in this novel had to be based on research. I never thought I’d enjoy reading flight sequences but Jude and Lyyndaya’s descriptions of their experiences surprised me and made me think about what it would have been like to fly in one of the open-cockpit planes that were flown in this period. Murray presents us with a view of the Amish that hasn’t been overly explored before. Nowadays, we think of them as a religious group who have rejected many modern conveniences. But The Wings of Morning visits the Amish while they’re still trying to figure out whether or not to permit the use of electricity and aeroplanes, having recently banned the telephone and ownership of motorcars. The picture presented in this novel is not of religious leaders who wish to make life hard for their followers by rejecting the use of certain technologies, but of a group determined to preserve the bonds of family and community over convenience. The leaders of Jude’s community struggle to come to an agreement over how they should deal with his interest in flying and are unhappy when they feel they must shun him when he agrees to use his flying skills in the war in Europe. Murray definitely seems to have captured the essence of what we “Englishers” admire about the Amish, and while he doesn’t openly endorse their way of life, he presents the dilemmas and struggles that made them into the iconic people we see them as today. The biggest issue surrounding the shunning of aeroplanes is that they can be used as a weapon of warfare, and although the Lapp Amish community may be joyful when watching Jude flying his plane at their Fourth of July picnic, they are acutely aware that the aeroplane is a force that can be used for good and evil. Jude struggles with this dilemma also when he finds himself based in France. He does not want to kill, but how can he sit by idly as his friends are shot down by enemy planes? Murray does not condemn nor endorse pacifism, and I appreciated that he didn’t take sides on this issue. I found myself becoming increasingly wrapped up in Jude’s struggle and wondered how I would react in a similar situation. While ideologically I oppose to the concept of war, I don’t think I could suggest that my country should not defend itself if it were attacked. The Wings of Morning subtly discussed this idea, as both Jude and Lyyndaya serve their countrymen and without compromising their beliefs. 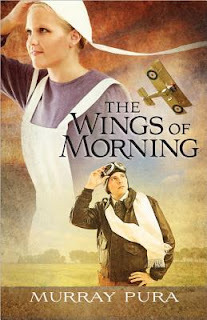 I would class The Wings of Morning as a historical novel, but it does contain a romantic aspect to it. But because Jude and Lyyndaya are kept apart for the majority of the story it does not take on the conventional romantic structure that readers of Amish fiction will be familiar with. Jude and Lyyndaya are unable to receive letters from each other, but continue to write in the hope that when Jude returns from war he will be accepted back into the community and then they can read each others’ letters. I loved this device, as it kept the reader aware of the characters’ emotions regarding their relationship and gave them each a place to express their feelings about the wider situation of the war and the Spanish Flu. Of course, Jude and Lyyndaya get their happy ending eventually, but I felt it appropriate that the novel ended on a positive note considering all that they had suffered over the course of the book. The Wings of Morning crosses the genres of historical, Amish and romantic fiction and will hopefully appeal to readers of each of these groups. Murray Pura shows the beginnings of being a popular voice in inspirational fiction and I look forward to reading more emotionally stirring and well-researched depictions of history in the next volume in his Snapshots in History series. Review title provided by Harvest House Publishers. Oooh, that sounds really good! Pura and I share an agent so I've heard of his work, but I've never read him. This sounds very interesting! Thanks for the review. Great review, Rachel! I want to read it!